EPA has been a volunteer organization run by postdocs with one goal in mind: to serve the postdoctoral community of the Albert Einstein College of Medicine. The mission of the EPA is to improve the scientific interaction among postdocs and the quality of their personal life. The Einstein Postdoctoral Association (EPA) was founded in 1996 as one of the first Postdoc Associations in the United States. Every postdoc joining Einstein is automatically part of the EPA. We currently have around 275 members. From the beginning, the EPA has been a volunteer organization run by postdocs with one goal in mind: to serve the postdoctoral community of the Albert Einstein College of Medicine. The EPA meets periodically with the leadership of the Belfer Institute to discuss topics of interest, importance, and concern to the postdoctoral community. By working together, over the past several years a number of academic programs have been initiated and quality-of-life issues have been addressed successfully for postdocs by the Belfer Institute and the EPA. The association has two primary roles, (i) to provide both social and career development resources for postdoctoral fellows at Einstein, and (ii) to represent the interests of this group directly to the Einstein faculty and administration as needed. All employed Einstein postdocs are automatically members of the association. The faculty and administration of Einstein actively encouraged the formation of the association, and it was established by a number of volunteers who assembled as an exploratory committee. - Welcome you to Einstein! The EPA representative of your Department will welcome you with a survival kit (air mattress, pot, plates, cups, etc. ), a welcome mug. He/She will be happy to answer any question. - Encouraging scientific interaction within the Einstein postdoctoral community. Promoting career development by offering information about career choices both in research and non-research areas (including seminars on grant writing, lab management, alternative careers, etc.). - Representing the interests of postdocs, in both formal and informal settings, to the faculty and administration of Einstein (issues of interest include salary, housing, visa/immigration issues, day care and other facilities). - Organizing regular social events for postdocs and their families (International Coffee Hour, Winter Social, Spring/Summer Parties, etc.). Ultimately it is up to the postdocs at Einstein to make things happen! Please contact the EPA with any opinion or concern regarding postdoc life on campus. The association includes four executive cores: Advocacy, Communication, Social and Einstein Community. 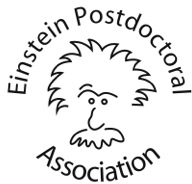 The Einstein Postdoctoral Association (EPA) was founded in 1996 as one of the first Postdoc Associations in the United States.